Clearly defining a meeting agenda enables effective communication, promotes organization, and increases productivity. Use the meeting agenda before, during, and after your meetings. Below are guidelines and tips to create your own. 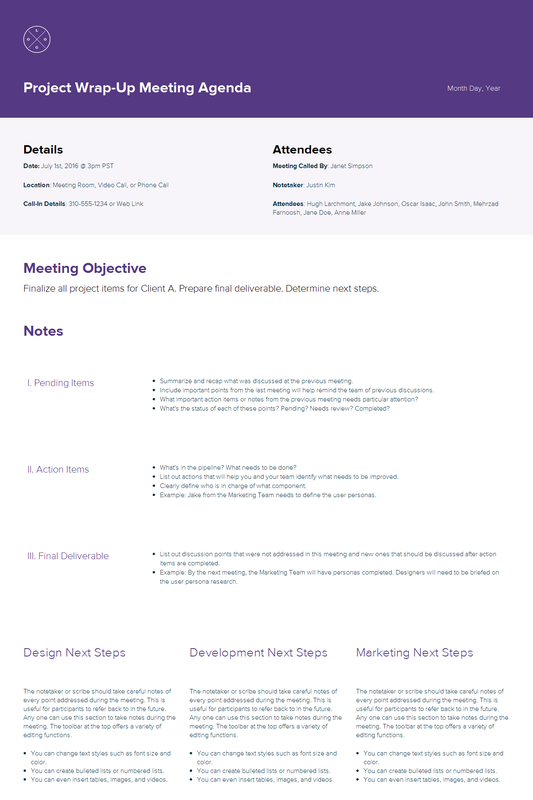 Follow along with our free Meeting Agenda template. 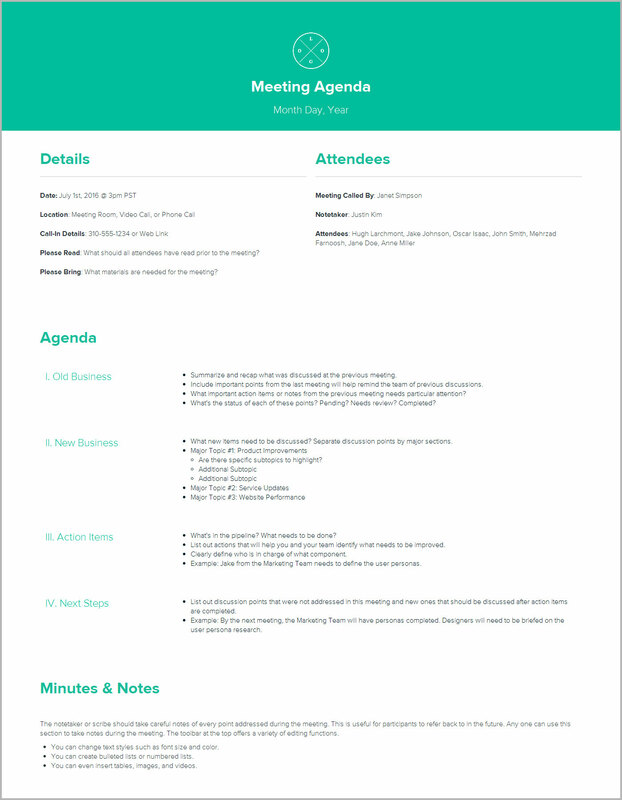 Create your meeting agenda -- It's free! These meeting agendas were made using Xtensio. Below are tips and tricks to filling in the Meeting Agenda. 1. Define your meeting goals and expectations. Before you begin, we encourage you to carefully consider what the goals of the meeting should be. What should the discussion revolve around? Which actions are of the highest priority? Answering these questions will help you more quickly arrange your agenda for maximum productivity. Maybe you’ll use your agenda to go over your fundraising summary from last quarter, or maybe you’ll discuss the next company press release, a new case study or a revamp to the company media kit. Use the text toolbar to organize information by varying font size, color, or text styles. Don’t forget that you can insert tables, images, links and videos to reference during the meeting. This section should reflect the letterhead of your company’s documents. Replace the placeholder with your company’s logo. You can leave the title as “Meeting Agenda” or be more descriptive with a title like “Kick-Off Meeting for Project X.” Then, set the day, month, and year that the meeting will take place. Don’t forget to change the background section color to match your company’s branding too! Bonus Tip: Read more to find the Business Model Canvas explained and use the template capture your business plan in a lean one-page diagram and streamline planning, development, and execution across your business. 2. Prepare the meeting logistics. Here, you can specify the exact date and location. If your meeting is online, make sure to include call-in details for phone or video calls. 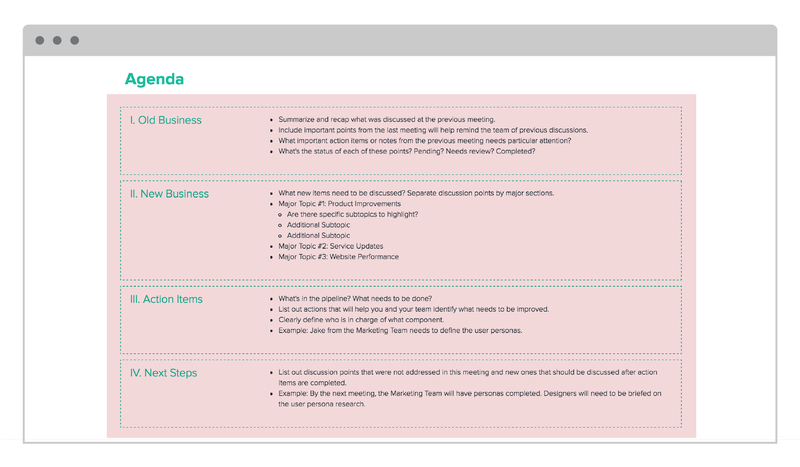 You also have the option to specify what attendees should read or bring to the meeting. This will make it clear what attendees should be prepared to discuss during the meeting. This is pretty explanatory. Who is leading the meeting? Who is taking notes? Who are the other attendees? All meetings must have a stated purpose or agenda. Attendees should walk away with concrete next steps or action items. The meeting should have an end time. 3. Organize your agenda into sections. 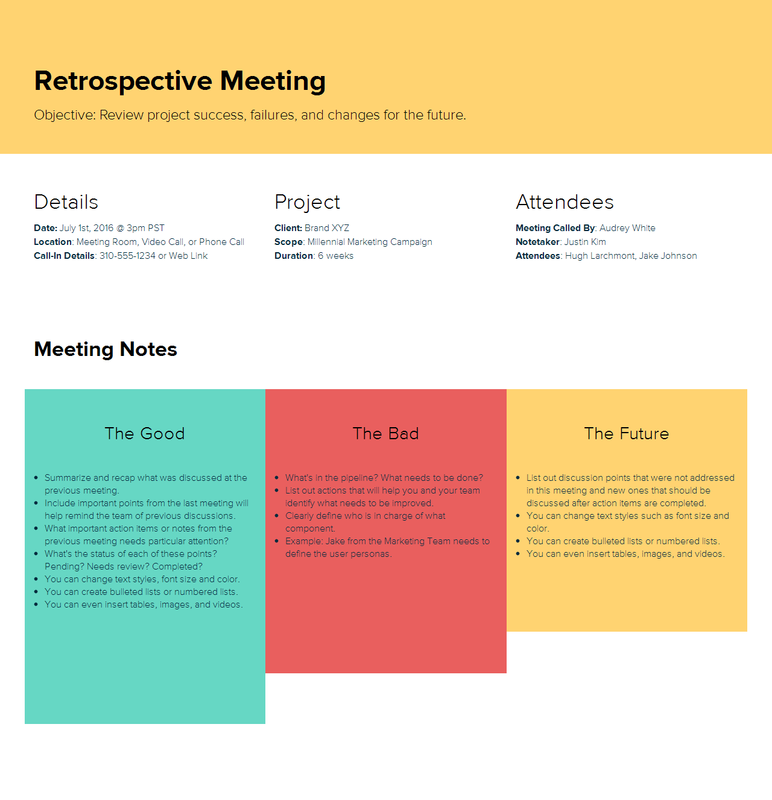 Use this space to review what was discussed in previous meetings. This will give everyone context to the current meeting and a better sense of what’s to come. Are there any important action items or notes from the previous meeting that need particular attention? What’s the status of each of these items? Still pending? Needs review? Completed? Identify what’s needed to close any open items. After reviewing old business, go over new business topics. What new items need to be discussed? Team members should be able to contribute updates to their individual projects and action items. Keep things organized by dividing major discussion topics by subtopics. This space will help you organize the projects that need to be reviewed, started, or finished. Reviewing action items will ensure that everyone in your team is on the same page. In addition, defining who is responsible for carrying out each action item will keep everyone accountable for completing the task. What future items should everyone make note of? List out any additional discussion points that were not addressed in this meeting and new ones that should be discussed after action items are completed. Advice: At Apple and Google run their meetings differently. At Apple, every project component or task has a “DRI” or Directly Responsible Individual to encourage accountability. Don’t be afraid to kill ideas. After Larry Page replaced Eric Schmidt as Google CEO, the company quickly killed its Buzz, Code Search, and Desktop products so it could focus more resources on less effort. 4. Include a section for additional notes. Everyone should be taking notes during the meeting (or at least recording pertinent information that applies to him/her). If there’s a dedicated notetaker or secretary in charge of the minutes, this person should be taking detailed notes of everything discussed during the meeting. These notes will serve as a reference in case any questions arise after the meeting. Last Tip: Don’t forget that there are many different types of meeting structures. Some startups and companies employ a daily stand-up meeting (also known as a “daily scrum”) where the whole team meets every day for a quick status update. These meetings require standing up to ensure that the meeting is short. Remember, this document is flexible and can adapt to your needs. You’re not bound to the template’s current structure. 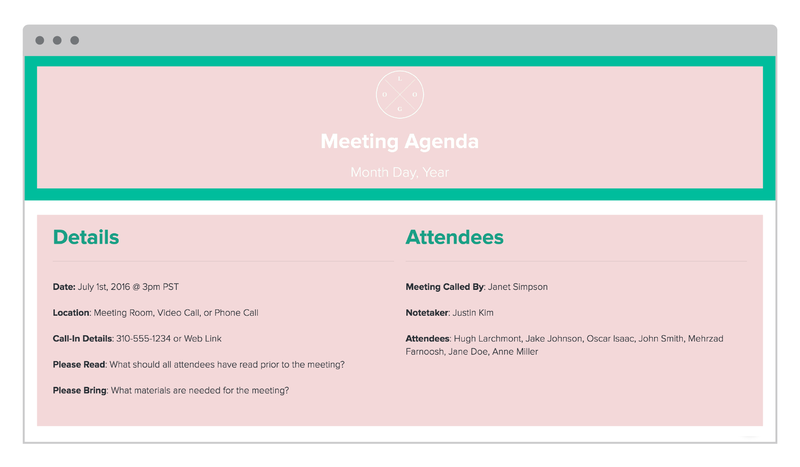 Continue to tweak and optimize your meeting structures and agenda template until you find the right fit by rearranging or adding elements. Whatever your use case, just make sure it’s organized, easy-to-follow, and keeps you on track!